^ a b Dugan, Dan (2002-01-01). Michael Shermer (ed.). Anthroposophy and Anthroposophical Medicine. The Skeptic Encyclopedia of Pseudoscience. ABC-CLIO. pp. 31–32. ISBN 978-1-57607-653-8. ^ Heusser, Peter; Kienle, Gunver Sophia (2009). Abrams, Donald; Weil, Andrew (eds.). 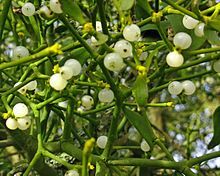 Anthroposophic medicine, integrative oncology, and mistletoe therapy of cancer. Integrative Oncology. Weil Integrative Medicine Library. Oxford University Press. p. 327. ISBN 978-0-19-988585-5.